The PCT begins on a low hill near Campo (elev. 2,600’), a small town near the Mexican border. It passes through Lake Morena County Park and beneath Interstate 8, then climbs through chaparral, scrub oaks, and pines to the rim of the Laguna Mountains. The trail dips into Anza-Borrego Desert State Park at Scissors Crossing, then winds up, down, and around the San Felipe Hills and lesser mountains of the Cleveland National Forest before crossing Highway 74 at 4,900’ and climbing the backbone of the San Jacinto Mountains. It reaches its highest point in this section at 9,030’ shortly before it plunges to its lowest, crossing beneath Interstate 10 at elev. 1,190’ in broad San Gorgonio Pass. 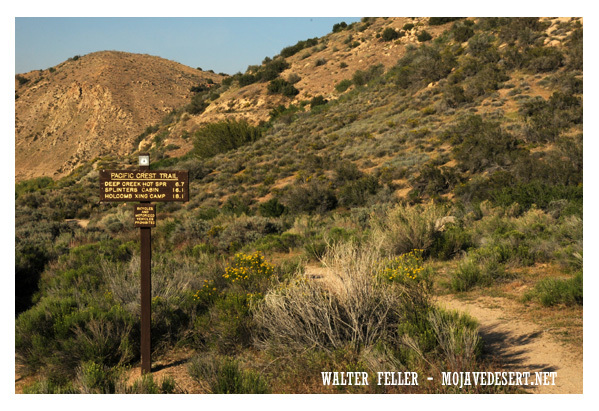 The Southern California section ends where the trail crosses Highway 178 at Walker Pass (elev. 5,246’). The mountains of this section are bounded by and internally laced with faults that have been active in recent geologic time. The animals in this section include lizards, rodents, snakes, coyotes, and cougars. Colorful and quick, hummingbirds can also be seen darting about, gathering nectar. The plants here are generally desert scrub, chaparral, or oak, with forests only at the higher elevations. Trail-side water is scarce in this section, particularly in the summertime, when temperatures range from the 80s to the low 100s. From the confluence, west to the lake. Hiking east from Grassy Hollow to Wrightwood.